Walla Walla, Texas Sweet, Vidalia, Sweet Spanish - Would an onion by any other name taste as sweet. Truth is the soil and moisture has everything to do with how sweet an onion will taste. Low sulfur levels in the soil and consistent watering during the growing season combine to make a sweet onion “Sweet.” The names associated with areas of the country where they are grown should give you consistent flavor when you purchase them. Regional onion names, like Walla Walla and Vidalia, are protected through either federal or local orders that decree only growers in the named regions can market their crops by the regional name. Walla Walla onions can only be grown in a 15-mile radius of Walla Walla Washington. Vidalia onions are confined to a 20 county area in Georgia. So, farm growers who sell their crops cannot use these names unless they grow them in their assigned areas. But, can you grow these specially named varieties and expect the same results? The quick easy answer is no, you won’t get a Vidalia onion if you grow it in Cleveland. You will get a good, sweet onion if you select a variety suited for your area and growing conditions. Vidalia onions grow from Granex hybrid seed. 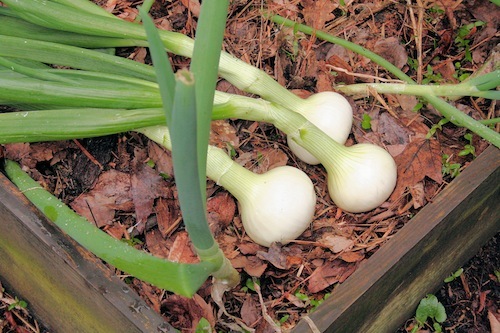 You can grow Granex onions in southern states, or anywhere considered short day areas. Granex is a white onion with light yellow skin, averaging about 3/4 pound. Texas Sweet is also a short day variety with the same yellow skin. It is derived from the Sweet Bermuda Yellow onion. Texas A&M University has developed improved strains through the years. Texas Grano is known to withstand the early heat and drought conditions of the Deep South. The Sweet Spanish Hybrid is a very mild onion. It is best suited for northern gardens because of the longer growing days. The bulbs often can reach a pound and store much better than southern grown sweets. Yellow Ebenezer is another long-day variety with a somewhat stronger taste. It will also store a bit longer than the short-day onions. Check with your local University Cooperative Extension Service or seed catalog descriptions for the best type of onion for your area. Generally, short-day varieties are best for southern areas and regions that receive about 12 hours of daylight. Long-day onions do best in northern gardens, or anywhere daylight lasts about 14 hours.